In light of our previous blog that took an in-depth look at flat springs, we began to think about the other types of spring that also do not adhere to a coil shape. We stock a number of these springs, and you might be surprised at how many there actually are. Rather than utilising a coil shape, constant force springs make use of an unusual &apos;wound roll&apos; form. Perhaps the most remarkable property of constant force springs is the fact that they completely disregard Hooke&apos;s Law; the rule that proves so fundamental to the use of springs. A constant force spring is relaxed when it is rolled up, and, as the name suggests, any force that it applies within motion is consistent. Used within the automotive, aerospace, defence, medical and retail industries, the way in which these devices can be variously fitted or partially extended makes them incredibly flexible to use. Perhaps the most unusual spring type within our collection, wave springs are made from the same pre-hardened metal as flat springs, and are instantly identifiable due to their multi-level &apos;framework&apos;. It is this unique &apos;wave&apos; shaping that actually gives this type of spring its &apos;springy&apos; properties, and the number of these waves directly determines how much force each spring can accommodate. 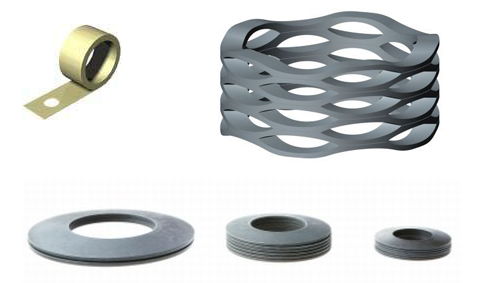 Because they use less material than coil springs, and are generally smaller, wave springs are fantastic for spatially confined areas, and they are most widely called upon in load-bearing situations. The name &apos;disc springs&apos; instantly suggests what sort of shape these components are going to display. Also known as a &apos;Belleville washer&apos;, disc springs look very like a conventional washer, and can be stacked to alter both the constant and the amount of deflection that is required. Disc springs have been in use for more than a century, and these high fatigue springs are used in a range of situations, including bicycle locking devices, and even within Formula 1 cars and the some of the most modern aircraft. They are especially famous for being included within clutches and brakes, and the longevity of these already hardy springs can be enhanced with a variety of treatments. As has been made evident, springs are certainly not restricted to simple wire coils, and the three types of spring listed above by no means represent a comprehensive list of non-coil springs. Here at European Springs, we stock a huge range of components in the instantly recognisable coil form, and also a vast assortment of springs and pressings in almost any other shape that you could think of. Whatever you&apos;re looking for, we&apos;re sure to be able to help, so do not hesitate to contact us now to find out more.